The phenomenon that surrounds us today is a new form of addiction, according to experts. And while the productivity that your handheld can provide you with is under no challenge, what we now witness is an unparalleled level of euphoria and obsessive behaviour about our phones. Protagonists place a firm argument when they say that today’s phones are not just phones, they are complete toolbox for all kinds of activities including leisure, research, communication, information, networking, recording, photography, news and all. But even if that were true, why would we voluntarily cling to it all the time. The answer is that beyond a certain level of functional need, lies the undeniable garb of addiction. Here are some statistics to savour: According to recent research from dscout, people tap, swipe, and click an average of 2,617 times per day. For the top 10 percent of users, this number doubled to 5,427 touches per day. That’s about 1 million touches per year and 2.42 hours of phone screen time per day. More serious users interacted with their phones even more, at 3.75 hours per day. This data includes all types of interactions, from reading and sending texts to scrolling on social media. How much time we spend on our phones. On the home front, our affinity to our technological gear is leading towards insulation from our own families, where each takes to their phone even though we are all meant to be meeting up. Going forward, and because we remain liberal towards the use if phones, gadgets are openly used in mosques, imambadas and cemeteries. Most if these users are intent on sharing photos and puns where their real presence at such a sacred place was meant for self purification and reflection. 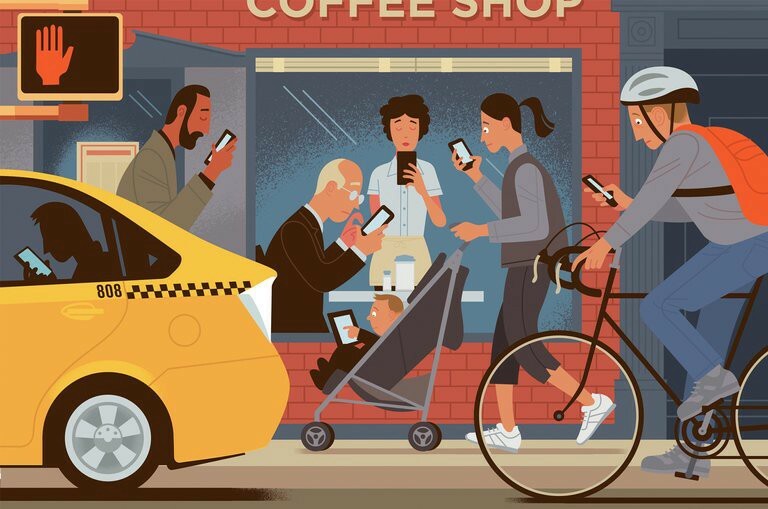 One fails to comprehend whether we are really that tech savvy or just plainly hooked to a habit of snapping everything we see then share out to the whole world. A new debate is now raging amongst all major faith groups worldwide whether allowing phones in places if worship is a good thing. Rev. Msgr Gabriel Osu, the Director of Social Communications, Catholic Archdiocese of Lagos, in a recent interview with the News Agency of Nigeria (NAN), called for phones to be banned. “People have turned a positive invention to misplacement of priority; such an act does not show reverence to God and should be prohibited in places of worship,’’ he said. Pope Francis has a message for the youths of Poland, and the World. While addressing one million pilgrims near Krakow, he called on young people to do more about terrorism, rather than being “couch potatoes” glued to “the screen of a cellphone”, The New York Times reports. “Today’s world demands that you be a protagonist of history, because life is always beautiful when we choose to live it fully, when we choose to leave a mark. Some situations seem distant until, in some way, we touch them. We don’t appreciate certain things because we only see them on the screen of a cellphone or a computer. There are many other cases where places of worship are trying harder to deter the use if phones. Surprisingly, when wifi was made available during Hajj and phones began lawful invside Masjidul Haram, we suddenly may just have surrendered yet again, our opportunity of a quiet communion with Allah (SWT). We are suddenly now more interested in sharing the ongoings of our journey instead of passing through it with sincerity and devotion. Whatever we do in our local mosques, we are now doing in Hajj. To a thinking mind, the question is really not whether mobile phones are good or bad, for that would be the height of absurdity. The real issue here is that, like with everything else, where are we going to draw the line. Surely, spending so much money to fulfill a mandatory obligation and then to end up treating it like a normal vacation, where we move around like happy tourists, oblivious of the opportunity at hand, is truly shooting ourselves in the foot. Allowing of phones, if anything can reduce anxiety amongst near family, so essential communication is noteworthy but is it necessary to become roving photographers filling an instagram story in the presence if His majestic house? These thoughts do come out as old fashioned prima facie, but once we realise that the ritual of hajj is a simulation of the day of reckoning, where just like we wint have regular clothing (symbolised by the ihraam), we will most certainly not have our iPhones or our Galaxies with us.